If you recall when Anita Virgil wrote about her late husband, Andy Virgil, you might remember she mentioned several other artists who worked at the same New York art studio, Rahl Studios. One of those artists was Arpie Ermoyan, the wife of Souren Ermoyan, who was at that time art directing Good Housekeeping magazine. 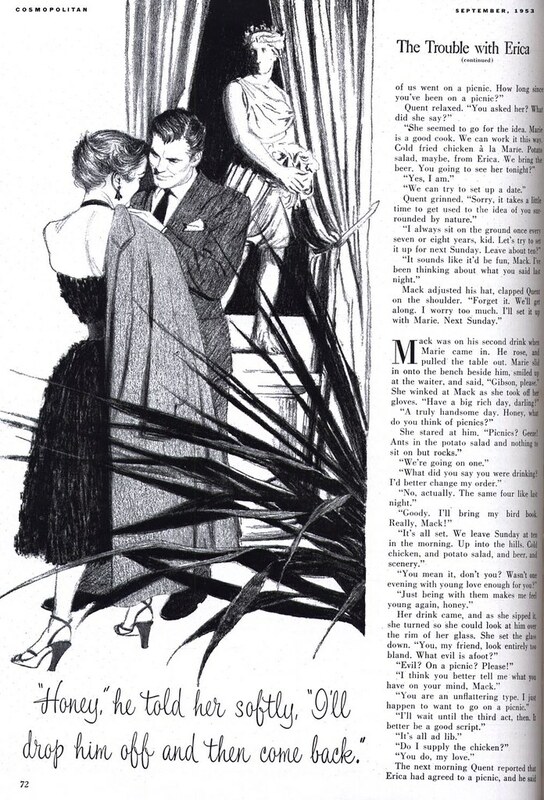 So Arpie Ermoyan became known to us... but aside from this one example of her work from the July 1954 issue of Collier's magazine, her work remained unknown. Well today I'm pleased to be able to show you not only a few more examples of Arpie Ermoyan's appealing artwork, but a picture of the stylish young artist herself. 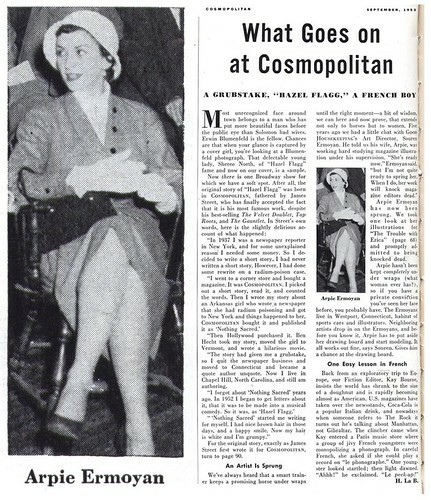 Thanks to this short article in the September '53 issue of Cosmopolitan magazine we now also know that the Ermoyans were part of that same Westport, Connecticut community of high profile illustrators that included Al Parker and Austin Briggs. The article mentions that she also modelled for some of those same artists. That's not surprising, considering what an attractive lady Arpie Ermoyan was. Over the course of the past few years, who knows how often we may have looked at some lovely lady in a painting by one of the Westport artists... and not realized we were actually looking at Arpie Ermoyan? The article suggests that this assignment from Cosmo was a sort of "debut" for Ermoyan . She had apparently been studying illustration for the previous five years. If that's the case, then she arrived on the scene fully formed. Her work on this assignment is top notch. 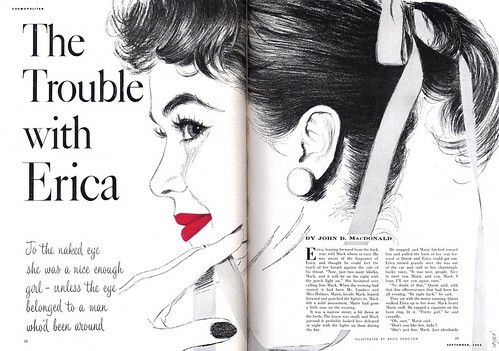 So why is there so little of it to be found in the various mainstream magazines of the mid-1950's? That, for now, remains unknown. * If you'd like to read the article on Arpie Ermoyan without straining your eyes - or just want to admire her illustrations at full size - you'll find all of today's scans in my Arpie Ermoyan Flickr set. Thanks for that comment, David - and the additional info on Mrs. Ermoyan. I will have to hunt down a copy of Famous American Illustrators -- sounds like a very useful resource! Your thoughts on the attitude towards women in the business cerainly rings true with everything I've heard ( even this brief article from Cosmo is stunningly chauvinistic in tone )... but beyond that there remains the mystery of the lack of appearances of Arpi Ermoyan's work in the major mags. She was at the same studio as Dorothy Monet, who managed to land many more high profile assignments from McCall's, Woman's Home Companion, etc. I'd love to learn more about what was holding Arpi Ermoyan back - because it certainly wasn't a lack of talent! This is great. Her name is so well known. 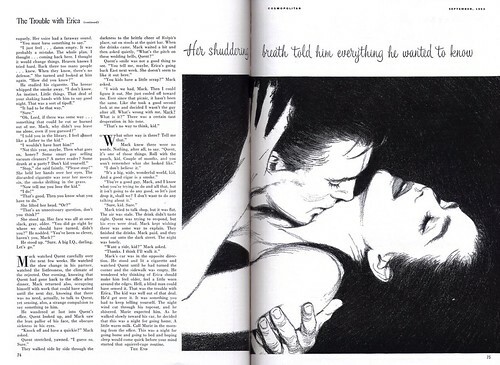 I knew that she was married to art director, was a model and illustrator and an author! It's suprising that little is really know about her. I have never seen any or her work, but she's had a huge impression on the illustration industry. And yes, get her book Famous American Illustrators. I got a copy of that Famous American Illustrators. I got it on ebay. All the previous posts are spot on, but let me add another one— Arpi's also an extroadinary mom! 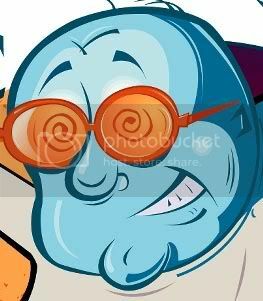 What a great collection of art! Spooky and stylized for Halloween and a wide array of artists to study.